Not designed for mass consumption? We spoke to a representative from ECS on the trade show floor at Computex today who revealed that it sees no real future in Intel's latest chipset, the Z68. It did, of course, have its own Z68 board, the ECS Z68H2-M, on display on its stand. However, despite this, ECS said that it was not planning on building many of the boards as it was expecting them to only have a very limited shelf-life. So what does ECS think is the next big thing from Intel then? Well, it's putting all its Intel eggs in the forthcoming X79 platform, the spiritual successor to the still dominant X58 chipset. This quad-channel memory toting varmint is set to be the perfect home for the new Intel Sandy Bridge-E CPUs that are inbound around the end of the year. These chips will need a new socket, the LGA 2,011 shown here. It's not just a clever name; that is a bigger socket with a whopping 2,011 pins in it. 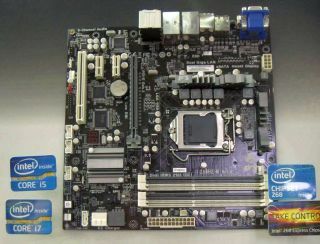 We've seen a few samples, mostly pre-production ones, of Intel's next motherboard chipset on the stands of the major motherboard manufacturers (like Asus' C1X79-EVO shown here in all its pin-heavy glory), but none are being so bold as ECS to state the Z68 is all but dead in the water.